Justin Alexander came to Santorini, Greece with one clear goal: to adapt to the Grecian lifestyle. By visiting every corner of the island and tasting the fruits of their legendary culture, his backdrops aim to show the timelessness of his 2018 collection, which features designs inspired by Greek-style weddings. “Timelessness” is the word that best defines this Greek adventure. And this characteristic oozes out of Alexander’s newest designs, which seem not be affected by the passing of time. All of his dresses are perfect for any bridal event, whether past, present or future, and never seem to look out of place. In each snapshot you can see the classical component that stands out in every single one of Justin Alexander’s pieces. The Greek island setting: the blue and white buildings, the light and the sea breeze, all provide a glimpse into the past, something that still remains in the past but simultaneously contemporary. The team working for the brand prepared a stylish wedding that put on show all the traditions characteristic of a Greek wedding. Those involved ate, drank, danced and laughed in perfect reminiscence of the Mediterranean party spirit. Seeing as the wedding took place on an idyllic Greek island, the marine component not only lit up the cultural aspect, but also, contributed to the beauty of the photographs, in which the blue of the Aegean Sea is a dominant feature. The bride wears a jewelled dress that tightly hugs her figure whilst the skirt and tail flow freely thanks to the delicate tulle fabric. Tight-fitted and trimmed with lace up to the knees, this traditional and mermaid-like design also features a heart-shaped neckline and voluminous, free-flowing tulle skirt. 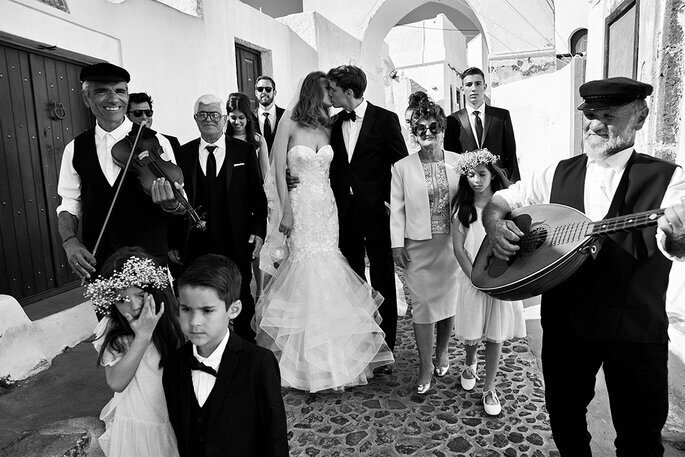 In compliance with Greek tradition, the bride’s dress epitomises the character, passions and authenticity of the islands’ spirits. With a transparent back, this dress seduces in its combination of classicism and sensuality. The bevelled back and free-flowing skirt, promising a sea of opportunities, produce opposing effects and are finished off with lace details, both on the shoulders and at the base of the back. The next piece, in line with the Mediterranean spirit, brings together the remnants of one of the most authentic cultures. The lace and transparencies come together, combine and contort in this long and fitted dress. The dress remains elegant, even though the low cut neckline and daring figure, shaping the woman’s every move, give it an air of sensuality. In perfect cohesion with the mysticism of the Aegean, this classic and sophisticated design is one the most original pieces in Justin Alexander’s 2018 collection. The monochrome dress, held together with a sparkly belt, contrasts with the revolutionary character and marine imprint that enhances the model’s figure. Classic and traditional, this tulle skirted number is a reminder that past trends have no reason to die. In fact, the dress is a delightful reminder of the past that, thanks to the intricate lace, is still made relevant to the present. The common feature of this collection, the combination of lace and transparencies, is also visible in the dress’ long sleeves. The collection’s most elegant design is held together by buttons that run from the shoulders to the floor. The design, sewn onto a lace back, is inspired by nature and is indicative of its rebellious facet, whilst the subtle and simple sleeves, render it more serious and sophisticated. The rest of the dress flows freely to the floor with a sensuality that looks to exalt the figure and delineate its curves. The white is smart, innocent and dazzling all at once. To finish, we will focus on a more daring and exciting modern piece for brave, one-of-a kind women. On the surface it appears simple yet the dress looks to break boundaries with its dramatic neckline and skirt that unties gracefully, showing all of its density and volume. Remember: Justin Alexander represents the timelessness of bridal fashion. In his charming display in Santorini, the designer demonstrated that past and present can coexist, and when they do so, they create something truly captivating.